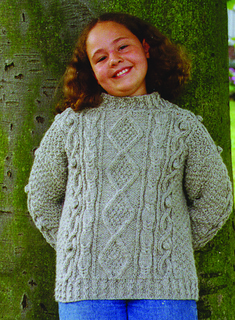 This Aran is knitted in the round up to the armhole, then is split so that the Front and Back can be worked separately. The sleeves are also worked in the round up to the armhole, where they are joined to the body by working a variation of the knitted (or “Three Needle”) Bind-Off. Saddle shoulders are created by binding off the Front and Back shoulder stitches as the saddle is being knitted. The live stitches at the neck are picked up and the neck band is completed. Voila! No seams to sew! This pattern contains both written out directions for the motifs, as well as a chart, to accommodate all knitters’ preferences.